The Russian Revolution took place in 1917 when the peasants and working class people of Russia revolted against the government of Tsar Nicholas II. They were led by Vladimir Lenin and his revolutionary political party called Bolsheviks. The new comunist government created the country of the Soviet Union. Before the revolution, Russia was ruled by a powerful monarch called the Tsar. The Tsar had total power in Russia. He commanded the army, owned much of the land, and even controlled the church. During the period of time before the Russian Revolution, life for the working class people and the peasants was very difficult. They worked for little pay, often went without food, and were exposed to dangerous working conditions. The aristocrat class treated the peasants like slaves, giving them few rights under the law . Economic crisis made people to revolt against the poor conditions but they did not succeed. A major event previous to the Russian Revolution was the Revolution on January 22, 1905. A Large number of workers were marching to the Tsar’s palace in order to present a petition for better working conditions. They were fired upon by soldiers and many of them were killed or injured. This day is called Bloody Sunday. Before Bloody Sunday many peasants and working class people considered the Tsar was on their side. They blamed their troubles on the government, not on the Tsar. However, after the shootings, the Tsar was perceived as an enemy of the working class and the desire for revolution began to spread. In 1914, World War I began and Russia was at war with Germany. A huge Russian army was formed by forcing working class and peasant men to join. Although the Russian army had great numbers, the soldiers were not trained to fight. Over the next three years, nearly 2 million Russian soldiers were killed in battle and nearly another 5 million were wounded. The Russian people blamed the Tsar for entering the war and for being defeated in the battlefield. 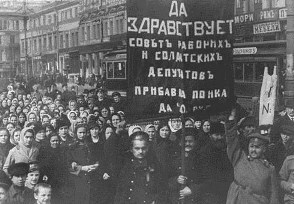 The people of Russia first revolted in February 1917. The revolution started when workers decided to strike. Many of these workers got together during the strike to discuss politics. They began to riot. The Tsar, Nicholas II, ordered the army to suppress the riot. However, many of the soldiers refused to fire on the Russian people and the army revolted against the Tsar. After the riots, the Tsar was forced to give up his throne and a new government was formed. The government was in hands of two political parties: the Petrograd Soviet (representing the workers and soldiers) and the Provisional Government (the traditional government without the Tsar). Over the next several months the two sides ruled Russia. One of the main factions of the Petrograd Soviet was a group called the Bolsheviks. They were led by Vladimir Lenin and believed that the new Russian government should be a Marxist (communist) government. 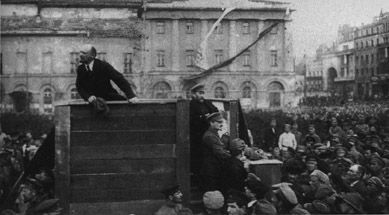 In October of 1917, Lenin took full control of the government in what is called the Bolshevik Revolution. Russia was now the first communist country in the world. Tsar Nicholas II and his entire family were executed by the Bolsheviks on July 17, 1918. After the revolution, Russia left World War I by signing a peace treaty with Germany called the Treaty of Brest-Litovsk. The new government took control of all industry and moved the Russian economy from a rural one to an industrial one. It also seized farmland from landholders and distributed it among the peasants. Women were given equal rights to those of men and religion was banned from many aspects of society. From 1918 to 1920, Russia experienced a civil war between the Bolsheviks (also called the Red Army) and the anti-Bolsheviks (the White Army). The Bolsheviks won and the new country was called the USSR (United Soviet Socialist Republic).